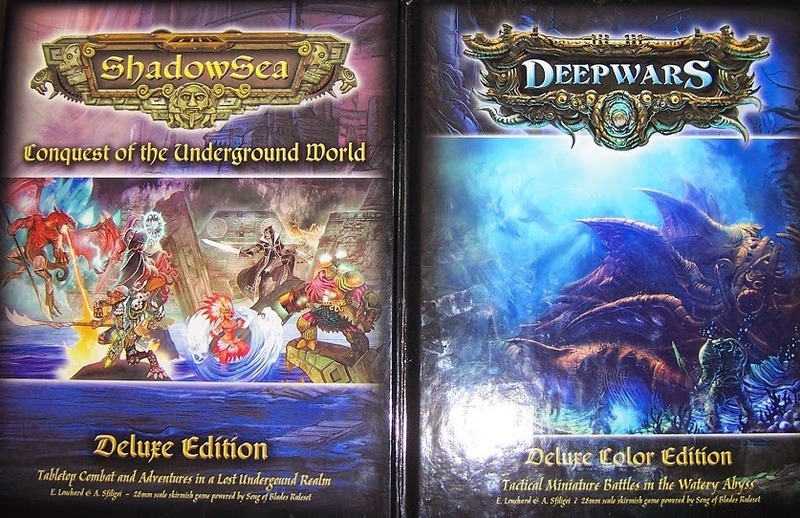 And time for another 'closer look at'-series of articles, this time for the numerous minis available from Antimatter Games (link) for their ShadowSea and DeepWars settings. Completely forget to add these to my blog, really enjoy these minis and AMG is running another Kickstarter project to add even more minis to the range (link). So if these minis or rules interest you, go and have a look at the project. Both lines, sets of rules and various scenery pieces are available and at quite a nice discount, there's even a rather big Lizardman on a Stegadon mount in there that could be added to the range. But lets get going with a look what these games are actually about. ShadowSea and DeepWars take place around the year 1690 where explorers have accidentally discovered an underground sea and landmass hidden beneath a fast, frozen wasteland in the middle of the ocean. The first expeditions sent to explore this new realm returned to civilization with tales of vast wealth and strange machines housed in vast ziguratan cities, which were fiercely garden by bestial warriors who's attacks were directed by their amazonian leaders. The huge fungal forests were also found to be teaming with all manner of dangerous flora and fauna, while the reptilian inhabits displayed worrying interest and cunning when dealing with the human explorers. But worst of all were the denizens of the actual ShadowSea itself, rising up from the depths the mutated Dark Mariners seem just as interested in defending their sunken citadels as they are out to capture these new invaders for whatever vile purpose may drive them. Harsh and brutal as this environment may be, the gold and technological artifacts retrieved thus far have proven extremely alluring for the great powers, both seen and hidden, of the human world. So guided by the technological advancements the famous Dr. Wormwood has managed to derive from the aether tech found in the ShadowSea, new expeditions have set out for fame, glory, science, greed and much darker purposes. - Both systems make use of the Song of Blades and Heroes rule set, by Ganesha Games, which results in a fast, D6-based skirmish game in which player field around 4-10 models per side. - Games are quite fast, usually taking between 30 to 60 minutes to play out, while utilizing an alternating turn structure. - Rules include magic, technology and vast opportunity for battlefield interaction, all set in a system that works great for individual games and lengthy campaigns alike. - And even though there is a lot of depth in character interaction, wounding and campaign progression, there is luckily very little, actual book keeping necessary. 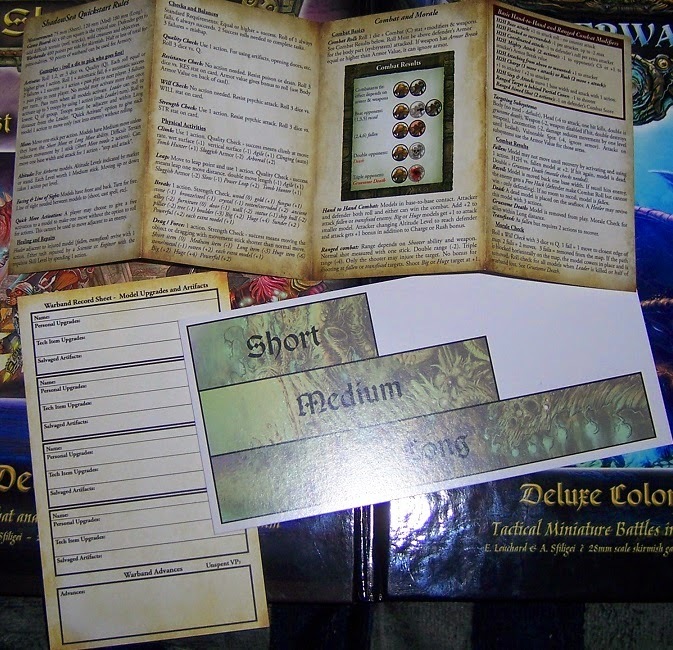 A single warband sheet, combined with the provided card for each model being played will see you through a game and campaign without any problem. - Flexible Warband building. Both settings have a faction that doubles as a mercenary force. This allows for a lot of different builds when putting together your warband. 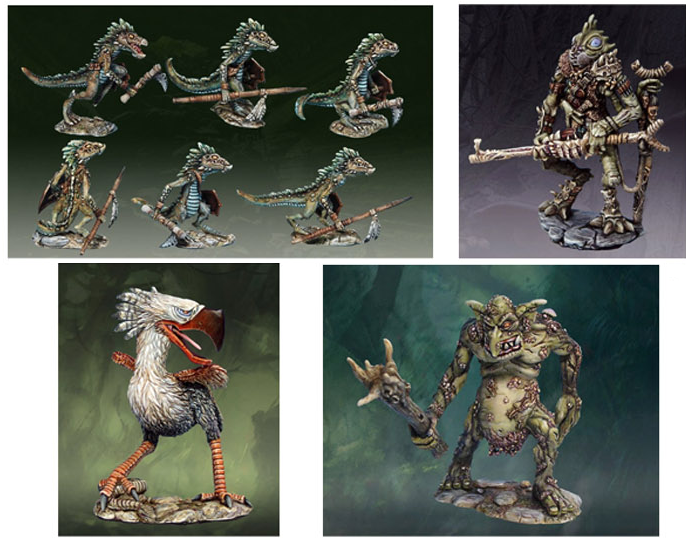 In addition these mercenaries have models that have powers allowing them to recruit creatures from both games' rather extensive bestiary sections. - Very diverse factions to choose from, including, among others, the human Fortune Hunters, the gribbly Dark Mariners, the serpentine Draconid Legion, the advanced Ancients of Atalan and the native Axibalan Empire. - While ShadowSea takes place in the cities, jungles and caves of this hidden land, DeepWars dives beneath the waves to explore the sunken citadels of a seemingly lost civilization, search treasure-filled shipwrecks, try to survive coral reefs housing deadly sea creatures etc. 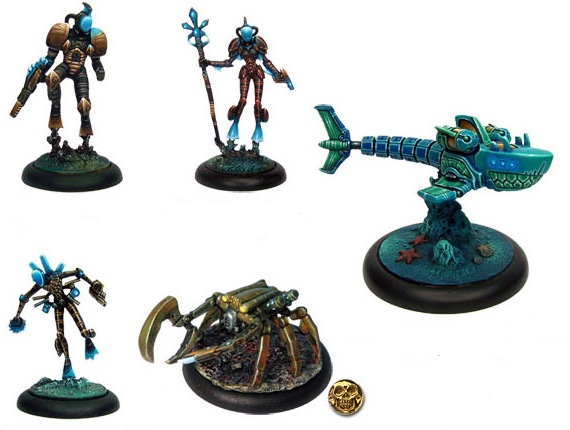 - As a results the DeepWars rules incorporate mechanics for actions like swimming at different depth levels, boarding actions, visibility levels, decompression, and a whole range of horrors from the deep, amongst others. - However, this doesn't mean that all the DeepWars' minis are limited to use in this setting. Certain models are capable of stepping onto the land of join their allies in the ShadowSea setting. - For certain models this is associated with penalties, usually due to their cumbersome equipment. Others like the Draconid Sea Devils, having only recently adapted to underwater life, are more prone to the negative effects of pressure. At the same time they are just as deadly under water and during boarding actions as they are on land. - The Dark Mariners, on the other hand, are an absolute menace where ever they show up, with the largest portion of their models being capable of transitioning seamlessly between both games. 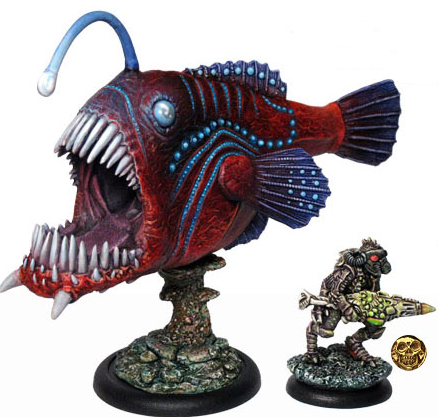 - Both systems use 28-scale models, ranging from human-sized Fortune Hunters, to towering constructs and wildlife like the Giant Angler Fish pictured above (50mm base). The models are cast in high quality metal and resin. - Among numerous other, sculptors like Bob Olley (link), Brother Vinni (link), Patrick Keith (link) and Eric Louchard (also the man behind this entire game, link) have worked on the model range. 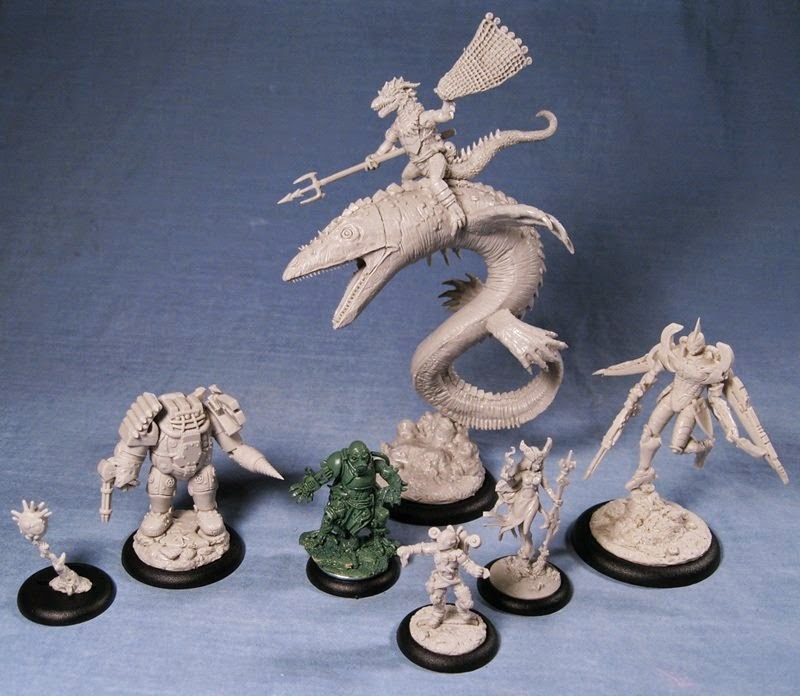 - All models come with beveled bases, as well as a themed base insert. What's particularly interesting is how well these insert have been designed, generally providing both added atmosphere to the model, but also providing a strong surface to glue the model to. - The DeepWars models are particularly great at this, allowing for quite sturdy models that have a real sense of movement that truly invoked the feeling of them drifting and/or swimming. In the next two updates I'll be having a closer look at the different factions, their background and models for both games. So stay tuned for some stunning minis! I've always been interested in these games and particulary in Deepwars. The setting and miniatures look great. My pleasure, pretty much my favorite game of the last couple of years. The models alone are worth it. The DeepWars stuff in particular is stunning, very characterful and surpirsingly easy to convert for use in non-swimming games. Should have another ShadowSea post sorted today, with DeepWars following very soon.